Babbling Brooke: Babbling Brooke's BIG 2nd Birthday Giveaway!! It's finally time!! Welcome to Babbling Brooke's BIG 2nd Birthday Giveaway!!! Babbling Brooke celebrates its 2nd Birthday/Blogaversary (aka: Blog Anniversary) on July 14, so I'm having a HUGE giveaway to thank all my wonderful followers! Blogging has been awesome these past two years and I am really looking forward to many more to come. Thank you to all my long-time, recent, and brand-new followers!! There will be TEN winners total! Total value of ALL prizes: $648+!! Nicole by OPI, China Glaze, Seche, OPI, Overall Beauty, A. Tierney, Kiss Nails, Juice Beauty, Nailene, Zoya, Mommy Pads & More, Revlon, & Evil Shades. This giveaway would have never been possible without their extreme kindness and generosity!! Thank you! You can learn more about my great sponsors HERE. The giveaway will be end on Wednesday, July 14, 2010 at 11:00 PM. Seche Secrets of the French Manicure Set, Seche Rebuild, Seche Recondition, 6 Nicole by OPI polishes, 8 China Glaze polishes, Nailene Nails & Nail Art, Juice Beauty To Go Kit, Kiss Nails & Electric Nail File, A. Tierney Starfish Bangle, 3 Zoya Polishes, Kiss Nail Files, Nailene Nail Accessories, Ponds Face Cleansing Cloths, Q Tips, Degree Body Spray, (not pictured): Evil Shades Cosmetics Git Package, customized Mommy Pads notepad, Nailene So Natural Nails, Nailene Couture Safari Nails (2), Nailene Nail Glue (2), Revlon Fantasy Lash false lashes (2). 23 polishes; 55 items total!! OPI Summer Flutter collection & A. Tierney bracelet pictured in grand prize have been moved to second prize because the final items that were to be added to the second prize never shipped. I apologize for any confusion and will happily purchase an OPI Summer Flutter collection for the grand prize winner if she/he is disappointed by this change. Coach Signature Mini Skinny (with gift receipt from PA outlet), 4 Nicole by OPI polishes, China Glaze Ridge Filler, Seche Vite, Seche Rebuild, Kiss Nail File, Kiss French Manicure Nails, Broadway Fashion Nails, Nailene French Manicure Nails, Healthy hands & Nails Lotion, Degree Body Spray. There will also be On the Spot prizes awarded on July 14!! There will be a new giveaway announced every other hour on Wednesday, July 14, beginning at 9:00 AM. Check back throughout the day; we will be giving away prizes at 9:00 AM, 11:00, 1:00 PM, 3:00, 5:00, 7:00, & 9:00 (Eastern Standard Time) for a total of seven bonus prizes!! Wednesday, July 14 all day to win many more fabulous prizes! The Grand, Second, and Third prize winners will all be announced before Midnight July 14. New followers and old followers are all welcome!! Click the "Follow" button and then leave a comment with your email address (1 entry). Check back each Friday at 7:00 PM for Guess that Polish to earn bonus entries! Be sure to visit Babbling Brooke on Wednesday, July 14, for your chance to win bonus prizes all day!! Total value of all prizes: $648+. All change rounded to the nearest dollar. Giveaway open Internationally. Prizes (other than Overall Beauty, Zoya, Evil Shades, & Mommy Pads) will be shipped by Babbling Brooke. Must be a Babbling Brooke Google Follower in order to win. Winner will be announced on July 14 before 11:59 PM. Winners will be selected through Random.org. This giveaway is amazing I hope I win something! ty for the awesome giveaway. It's finally here, the giveaways begin...who-hooooo! OK, I am a follower. But I am a nail polish newbie with less than 25 polishes so I'm hoping I score a lot more. Good luck everyone! I follow the babble! Great prizes,I am dying for a make over and this would do it! And I'll "like" this giveaway on FB as soon as I'm approved as a friend. i'm so excited for this! and congrats on your blogaversary! 3. I'm a follower of your blog AND twitter - and I tweeted your giveaway. "Like" you on FB, followed/tweeted on Twitter, and already a follower via GFC. I follow you, youre on my blogroll and I tweeted about the giveaway! Hey Brooke! I just started a blog so I posted about the giveaway and its in my sidebar! Hello! I am a follower via GFC. Thanks gain for this, it really is a truly phenomenal giveaway! OK I also followed you and tweeted about it! Holy canoli, girl! What a giveaway of the fabulousness. I have added a pic and a little info to my sidebar. Wow, what an incredible giveaway! 1. I am a GFC follower (whateveramber) and my email address is m2hnj25 at gmail dot com. 3. I've liked you on Facebook. I'm Amber V.
WOW! I have never seen such a HUGE prize pool! Hat's off to all of your sponsors - and to you for being so loved! :) I'd love to join your giveaway, and will blog about it asap! Thats sweetie so much for having this giveaway it was SUPER FUN! Hi Brooke! I am a follower and I have "liked" your blog on facebook. My email is abarker21@gmail.com. Happy Blog-o-versary! huge giveaway!Congrats on your 2 year of blogging. I'm soooooo not spaming your comments with my entries. I'm putting them all in ONE COMMENT! GASP. 2)I liked or followed your Facebook. I don't really want to put my full name on here so if you want my FB address/NAME email me. ;) It begins with an "A". This giveaway is just gigantic and fantastic. Fantabuloso!!!! This is so exciting! I follow via google friend connect and twitter. so i guess 4 entries total? :D lovely giveaway btw. Cool bananas Brooke, it's awesome! I don't have a Twitter account but I Facebooked posted about you to my 360 friends...does that count??! I think that covers it. Awesome giveaway thanks! This is an awesome giveaway! I follow with Google Friend Connect. Username: May, email mayliao1124@gmail.com. I hope I get to try some of these polishes! I'm a follower with google friend connect with the name susies1955 and I follow through bloglines too. Yay! Lots of prizes :) I did everything. * My email is punkstardust@gmail.com. * I followed your blog, but I also follow on an RSS feed. * My blog is lorrainenails.blogspot.com. I posted about your giveaway, posted it in the sidebar, and added you to my blogroll. * I followed you on twitter and tweeted about the giveaway: twitter.com/lorrainenails. * And I liked you on Facebook. I like Babbling Brooke in Facebook (Rebeca Crespo Diaz). I am already following you on twitter & I tweeted. Congrats on your two year! :) I'm a follower via facebook. Please enter me in your fab giveaway! Wow - two years of blogging & accumulating followers (I'm one...) - congratulations, & best wishes for the future! im a follower, and i like babbiling brooke on facebook! Oh! you're also on my blogue! Whoa Brooke what a giveaway! I'm a follower! And I added you to my blogroll. Thanks for having such a fabulous giveaway! I'm following you through gfc, name is Sharon. forever.infatuated(at)gmail(dot)com. And I follow with Google Friend Connect. Wow Brooke, this is INCREDIBLE!! You're on my blogroll and I like Babbling Brooke on Facebook. AND I did a post abut this giveaway with the prize picture. That is a very big grand prize! - I follow with Google Friend Connect. wow!! awesome!!! enter me pls!! u were on my blog roll list!! Hey it's Amy. You have my email from June 18th. This giveaway is huge! I'm so excited! OMG wow I would really really like to enter. my email is HappiPanda67 at gmail dot com and I am a new follower. Thank you! Oh my goodness, these prizes are amazing! I wrote a blog post. I put this giveaway in my sidebar. And you're on my blogroll. i added you to my blog roll and posted a blog about ur giveaway!!! WOW! This is the biggest giveaway I have ever seen. I am a follower and also liked you on facebook! I am truly amazed by this giveaway, please enter me. Just cool stuff! I discovered your blog a few days ago and I am loving it. wow, what an incredible giveaway!!! Hey Brooke! I'm a follower through Google. You're also on my blogroll! count me in for this giveaway! liked your page on facebook and my username is Sara Hassan there. following you on twitter and my username is xSara_H. added your blog to my blogroll!! I'm a follower through GFC as wund3rkind, and my email address is wund3rkind [at] gmail [dot] com. Hi! I'm a follower through GFC! Yaaayy this is what I`m waiting for! 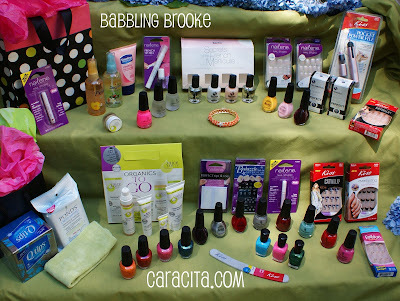 Thank you for this great giveaway and happy birthday to Babbling Brooke! I love your blog, keep it up! Here`s my blog post, http://houseofcanna.blogspot.com/2010/06/babbling-brooke-big-2nd-birthday.html please check it out! Also liked you on Facebook, the name is Aqilla Adhitama. Please enter me :) My email is fleurs dot nails at gmail dot com. Please enter me! My email address is hannahactually@gmail.com & I am following you via GFC. Thanks so much! Thanks a lot for this amazing giveaway! Wow! Wow what an amazing giveaway! I would be stupid not to try and enter. I am a follower and my e-mail is giffi4@hotmail.com. Great Give-away! Happy 2nd Blogiversay!!! Following & retweeted on twitter! I've blogged about your giveaway : http://nailartcreations.blogspot.com/2010/06/giveaway-alert.html. I tweeted about the giveaway and I'm following you on twitter. And ofcourse, I'm a follower of your blog. I have no idea how Blogrolls and sidebars work, so I'll leave it at this. irenka -dot- petrarca -at- gmail -dot- com. 4) I follow you on Twitter and have tweeted the giveaway link. I'm a follower and have liked you on Facebook. - I am a Babbling Brooke follower. i woud love love love to win! Please enter me this is an amzing givaway!! HI! huuuge giveaway! I'd like to partecipate!